We’re so excited about our (frightfully well-timed) October releases, Ghostly Hauntings of Interstate 65 and A Dead Guy at the Summerhouse, we’re having a Day of the Dead Giveaway! Enter to win, and share with a friend. We’ll be giving away eBook and paperback copies of four of our books, all of which feature a “dead” protagonist. We are pleased to announce our second October release, A Dead Guy at the Summerhouse by Marian Allen. This young adult paranormal mystery is set in 1968 against the backdrop of the Vietnam War. A young man takes a job with a wealthy eccentric. But things take a strange turn. Can Mitch escape the ghosts of the past, or will he become one himself? “It was 1968. Like a lot of seventeen-year-old males that summer, I was thinking about death. Not Bobby Kennedy’s or Martin Luther King’s. I was contemplating my own. I could feel my eighteenth birthday looming and I had to wonder if I’d spend my nineteenth in Vietnam, in Canada, in jail, or in the Great Hereafter. It was nearly the last mentioned, and not at the hands of the VC, either. I came this close to having my goozle slit right here at home in good old nothing-ever-happens Faelin, Indiana.” Mitch Franklin thinks he’s got it made when the town’s wealthiest eccentric hires him to look after her two lapdogs. Then he meets her family. Five years ago, the last guy she hired played head games the family and servants are still trying to recover from. He also wound up dead. Now, some people think Mitch might be just like him. Some people think Mitch might BE him, back from the grave. Will Mitch survive the anniversary of his predecessor’s death, or will he be another DEAD GUY AT THE SUMMERHOUSE? Sounds exciting, right? Take a trip back in time and into the unknown this October. Get your copy today. It’s a spectral spectacular! Ghostly Hauntings of Interstate 65 is live. 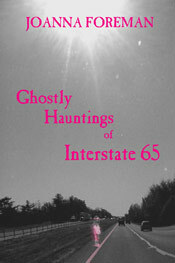 We’re proud to announce the re-release of Ghostly Hauntings of Interstate 65 by Joanna Foreman. Do you feel lucky? This collection of 13 spooky tales, based on fact and folklore, will bring a chill to your spine, just in time for All Hallow’s Eve! Go to the café, if you dare, but don’t sit in booth #1. Our ghost plays tricks on unsuspecting diners. How did the pristine, red 1968 Mustang arrive on Interstate-65 at midnight without a driver? Oh sure, the fortune teller had warned of a little girl in trouble, but why had she said nothing about pink? Sacred bones, of a prostitute no less, are unearthed during Interstate construction. See how she solves the mystery of a long-forgotten murder. The mansion was moved in preparation for the new highway, but what about the solid gold coffin in the cellar?